Friends, you are looking at an air tight filing system. I can find things. I save the cost of folders. My desk is about cost efficiency. My desk has character. Post it notes not only in different colors, but in different stages of stuck orientation. Napkins close by. Drink cups ready for action. All to help me get more done. That pin you see on my desk. I stole it from Michelle's desk because it ticks her off. It's fun. She knows when a pin has wandered off the reservation. She keeps track score of these things. My pins are next to the great pile of single socks in the sky. Where is the fun in this? You can actually see her desk top. Neat little piles and folders. Even her post it notes are neatly arranged. La tee da. I can hear the birds chirping, and the harps singing. Ahhh, a pretty green field with flowers, little dogs, and butterflies. I think I'm going to toss my cookies. But wait, there's more. Are things really as they appear? A SD micro chip adapter all alone in the darkness waiting for something to adapt to. There's room to grow and flourish. 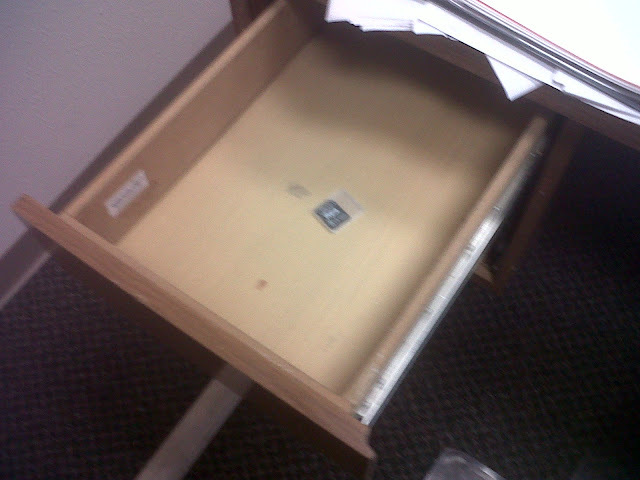 It's a desk drawer with great potential. That doesn't look so organized now does it. I think Michelle discriminates against receipts. She leaves them in an unruly pile, in a dark drawer, waiting for their day in the sun when proving we bought something. Michelle claims that I can ask for a receipt, and she can find it. As long as I tell her what month it was from, she can reach right to the correct month by the depth of the grab. 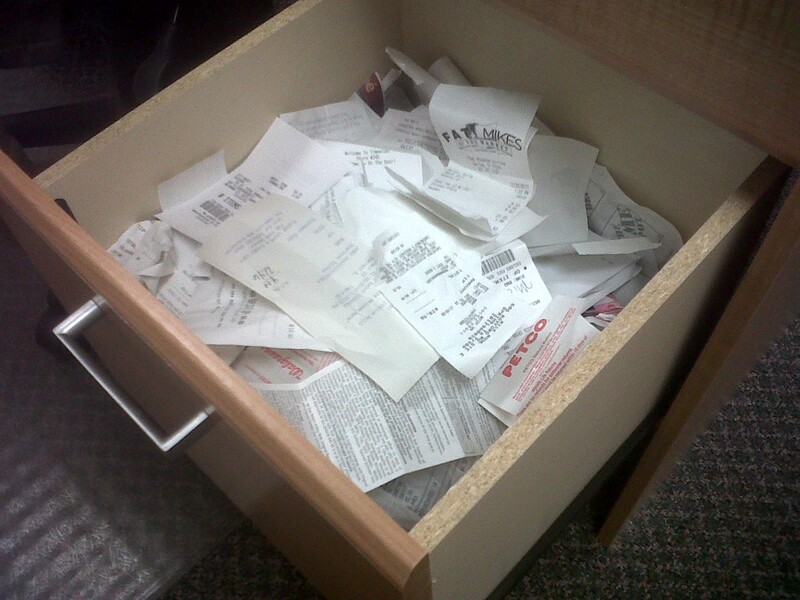 January's receipts, for example, are elbow deep - on her arm. It's a desk drawer with great drama. 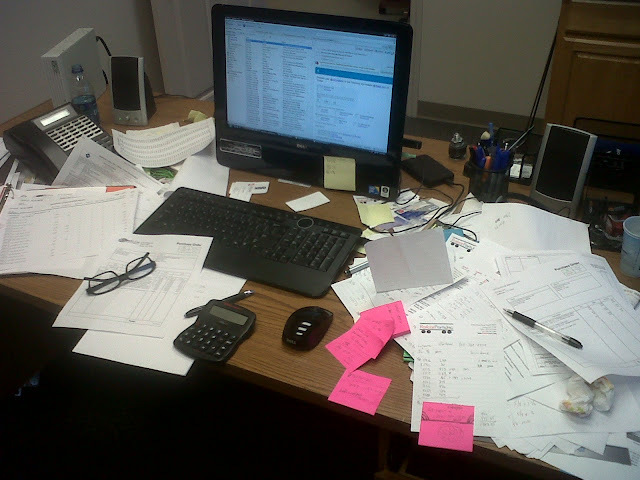 While my desk, to the untrained eye, may appear to be a mess and Michelle's desk appears to be organized, you need to know that there are more layers to that onion than meets the eye. Just something I needed to get off my chest on this first Monday of the new year. So, when Michelle begins to hurl insults my way as she catches me looking through the "files" on my desk, I fight back with the cold hard truth. Her desk is like that duck on the pond. Looking rather smooth up top, but peddling like Lance Armstrong underneath. Fight fire with fire baby. Our friend Melissa recently called Michelle "Pandora". That's because Michelle is a trouble maker. She revels in stirring the pot. Pandora fits her desk as well, and now it's my turn to stir the pot. PS. Michelle will see this post when you do, and if my next post is more than a few days away please call the authorities. too funny happy new year!! Thanks you Sweetlife. Let this comment show that I am still in one piece. Hey Scott! This post really made me giggle and wake up a bit this morning-too funny. I often think that the very organized individual usually only seems that way on the surface, hence I love seeing that messy drawer underneath a spiffy surface. 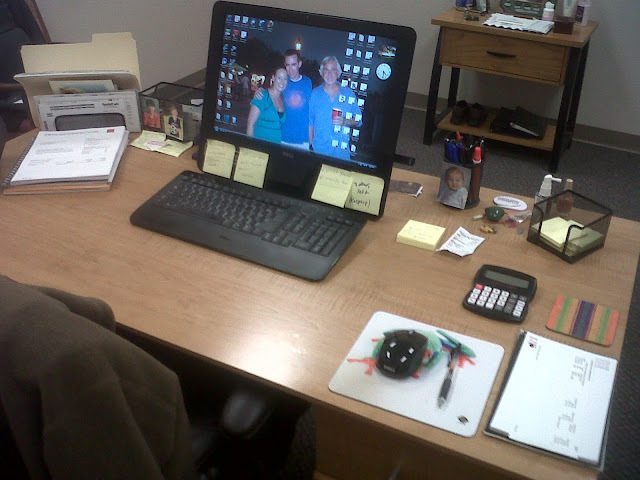 My Cauldron Boy's desk is like Michelle's. I suppose everyone need a little bit of 'messy' and 'who cares' in their life (smile)! Thank you Stella. Glad I got a giggle for you. Mission accomplished. Looking forward to seeing you around the blogosphere.